If you treat life as a journey, open to unexpected twists and turns, the exploration will inevitably lead to new people, new stories, new perspectives and inspiration. Rubee King, spending time in a tribal village in Maharashtra, found one such serendipitous connection, to a family, a love for their daughters and began to realise that personal creative solace is also a force for empathy. This is a story in reflection of an authentic human experience. Making our way through the outskirts of Sonoshi, a small village in the foothills of the Western Ghats Mountains, the late afternoon sun felt soft and inviting, unwinding from the heat of earlier in the day. During this time, somewhere between afternoon and evening, the world seems to awaken, between the pastel light and lengthening shadows. Quietly enjoying the serenity, our unhurried but purposeful walk was suddenly disrupted, as we stumbled across the most beautiful of gardens, in a seemingly unlikely location. More than a momentary distraction, the three of us were drawn to linger in admiration of the many flowering tuberoses and hibiscus, framed by towering, graceful mango and other herbaceous local species, many of which are ‘holy’ due to a capacity to produce life-supporting nourishment. After some time, lost eternal to allure of this natural place, we began to consider who might own such a lovely garden. It’s impact surprising profound, probably being such an unusual occurrence in a village like this. For all intents and purposes Sonoshi is a functional farming community, which typically determines practical harvest orientated uses for agricultural efficiency. We had to move on eventually, however feeling renewed after a long day assisting another local family in their mustard fields, the fresh scents of permaculture and momentary mindfulness a welcome boost, before returning home to share our experiences from the day. The following day we took the earliest opportunity to return, this time hoping to uncover the people behind the little oasis. We found Ramdas and his wife, respectfully referred to as “Moushie” (aunty in Marathi) at their home, happily surprised by our interest and as welcoming as their garden had seemed. This was the last time we were strangers, the first time Rubee met Ramdas. It’s hard to put a finger on it, but sometimes it is possible to know when you’ve made an instantly special connection with someone; an innate feeling that comes from shared openness, positive intentionality and deeply held, shared ideas on life. Over the next few days, Rubee, Ramdas and Moushie spent time together, often drifting for hours pondering various aspects of life, with the inspirational backdrop of Ramdas’s garden. Rubee felt a sense of peace, like stepping into the unique environment was being transported to another time, a sensation most likely linked to an upbringing sprinkled with many hours helping parents in their beloved garden. The time spent with Ramdas created an authentic, open space for Rubee to explore his perspective relating to agriculture as a livelihood, attitudes towards community efforts at development, sense his forward-thinking views on shared prosperity, and later reveal progressive views towards gender roles in household livelihoods. Somewhere amongst many conversations, Rubee discovered her host’s family tree, a long-held cultural association each family has for a particular species of holy plant. Interestingly, this seemingly innocuous conversation lead to a deep discussion relating to their two daughters, the empowered aspirations they project, and a sense for pride in their role as parents. During this time Rubee felt a deep sense of empathic connection to Ramdas. 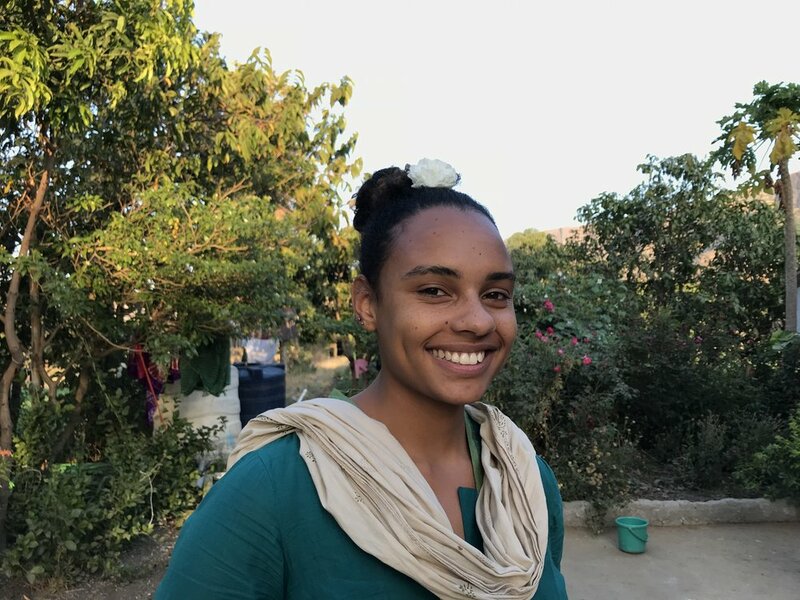 Feeling inspired by her experiences, Rubee spent considerable time reflecting, exploring with Drishtee Immersion team mentors, in an effort to make-sense of her connection with Ramdas. On the surface two vastly disparate people, yet feeling a strong sense of shared understanding. As a way of giving back, Rubee drafted a somewhat poetic letter and sketch, attempting to reflect the time they spent together, to respect their projection of genuine friendship. Rubee felt this an important step, to attempt to communicate her emotion to someone that on the surface is vastly different to her (an elder gentleman, farmer, Maratha, father, former village leader). Sharing back empathy is a vulnerable experience requiring opening oneself to the potential for adverse response (highly unlikely, though the mind is fearful of rejection!). Cutting across cultural and language barriers, Rubee wanted to project her understanding for Ramdas’s perspective in a simple, authentic way. When I think of Sonoshi, a vivid picture comes to mind… Dusty pink mountains nestle up amongst the clouds. Houses speckled along fields of green and gold. A small girl running up a dusty road, tucking beautiful flowers in her school uniform, a trail of stems following her as she moves. She reaches her front garden and digs into the soil, placing each flower with gentle respect. Soon the flowers grow tall and bright, sweet aromas of roses, tulsi, eucalyptus and mango filling the air. When the girl grows up and leaves for marriage her parents Ramdas Kaka and Moushie can look at their garden everyday and remember their daughter’s love. Rubee’s offering was received with joyful emotion, with Ramdas and Moushie expressing a sense of satisfaction that their feelings towards Rubee had been reciprocated. As if encouraged by this unanticipated display of authenticity, Ramdas shared more details about his special bond with the eldest daughter, who had since left the family home following marriage. Often in life we hold positive, loving thoughts for people around us, but fail to make these feelings clear. With a deliberate approach to empathy, that involves looking inward as well as outwards, it is possible to understand something more personal, to identify things most meaningful. This in-itself can trigger a deeper connection between the people, as experienced by Rubee and Ramdas. Ultimately this leads towards a shared empathic understanding, with unique perspectives on livelihood related needs, community aspirations and an engagement in whatever the future holds. Beyond father-daughter relationships, the source of their initial bond, it was discovered that they share a fundamental passion for artistic expression. Ramdas said “everyone has an art form” after considering Rubee’s efforts. Rubee replied “what is your art? Gardening?”, before Ramdas surprisingly suggested his interest was in fact “sketching, sketching dogs, cats, birds, mountains, landscapes and natural things”. Perhaps after all this was what drew them together, with the allure of a natural artistic haven, and a connection to authentic expression.